To make the dough, stir together the flour, sugar, and kosher salt in a medium mixing bowl, or in the bowl of a stand mixer. Add the cold cubed butter and use a pastry cutter or the mixer's paddle attachedment to blend until the butter is in small pea-sized pieces. Add 3 1/2 Tbs. ice water and mix until the dough starts to come together, adding additional water 1/2 Tbs. at a time if mixture feels too dry. The dough should just come together when you give it a squeeze. Gather the dough together and press it into a two-inch-thick disc, wrap in plastic wrap, and refrigerate for at least half an hour. While dough chills, make the frangipane by stirring the almond flour, sugar, and flour together in a bowl. Add the butter and almond extract and mix until smooth and evenly combined. Add the egg and stir until evenly combined. Leave at room temperature if you're planning to make the galette right away. If you'll be making the galette later, refrigerate the frangipane and remove thirty minutes before you plan to assemble it. To make the galette, heat the overn to 375°F and line a baking sheet with parchment paper. Lightly flour a large cutting board or other surface, remove the plastic wrap from the disc, and roll out with a rolling pin to around 14 inches wide, dusting with flour as needed to prevent sticking. Carefully place the dough circle on the parchment-lined baking sheet and refrigerate for at least 15 minutes to make spreading the frangipane easier. While dough chills, slice and pit the fruit, aiming for pieces no bigger than half an inch thich, and stir the sugar and cardamom together in a small bowl. When dough is chilled, use the back of a spoon or a silicone spatula to spread the frangipane in an even layer across the dough, leaving a two-inch border around the edge. 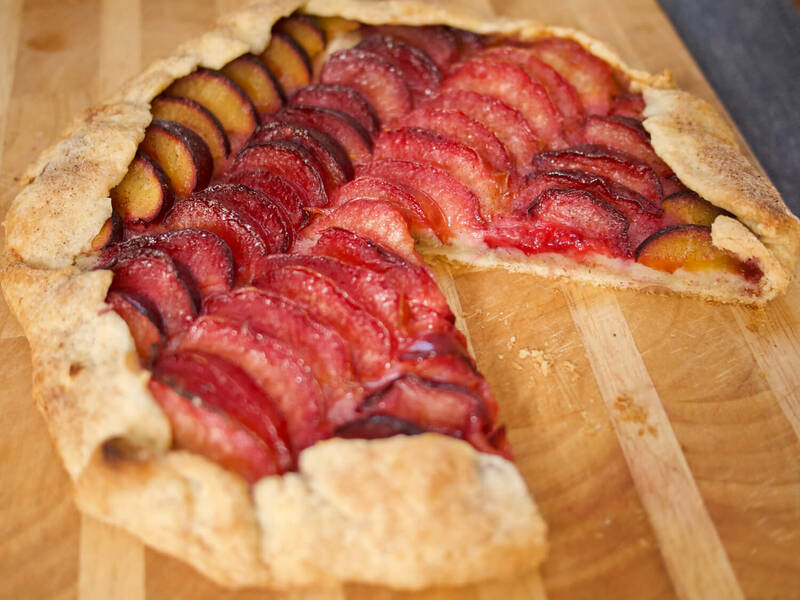 Arrange the sliced fruit across the frangipane - lines or circles make for a pretty galette! Gently fold the edges of the dough up and over the fruit, folding about four inches at a time, creating "pleats" at each corner. Make sure that the edges are completely solid, and that there are no holes or creases that would allow the fruit juice to escape. Brush the crust with the melted butter and sprinkle the remaining butter over the fruit. Sprinkle the cardamom sugar across the entire galette, making sure the get the crust as well as the fruit. Bake the galette until the crust is brown and crisp, and the fruit is cooked through, about 50 minutes. Allow to cool to room temperature before serving. Vanilla ice cream would be a great accompaniment as well! Serves 8. Adapted from David Leibovitz. This is our go-to cake. It looks humble -- just one layer, no icing, the fruit on top kind of burst open and starting to get jammy -- but once people take a bite, they’re hooked. Vanns ground cardamom and almond extract add a fragrant twist to classic rice pudding, while cooking the rice in almond milk lightens things up. Almonds and Vanns Almond Extract add a hint of nuttiness to these citrusy marmalade crumble bars.